The Don’s Special is one of three patterns created by Carrie G. Stevens of Upper Dam, Maine, in the 1930’s or early 1940’s for her friend and guide client of her husband Wallace, George Donald Bartlett. Don, as he was known, was extremely proud of the fact that Carrie named three flies after him, this according to his daughter, Lucy Bartlett Crosby. 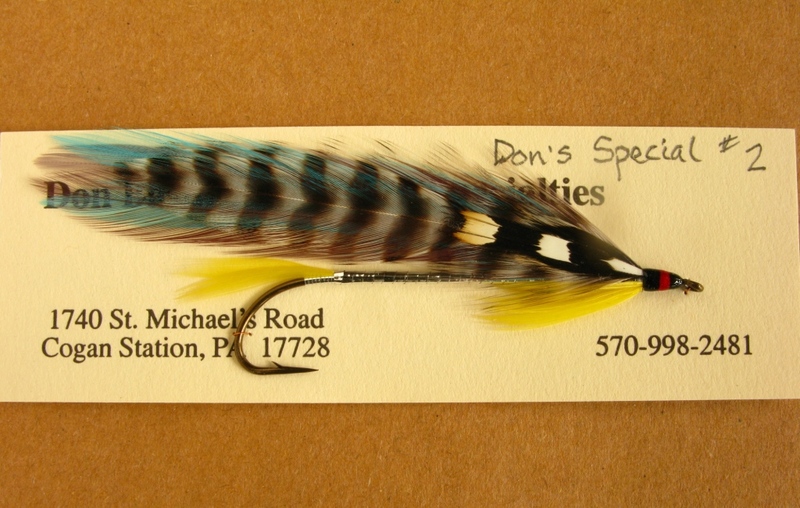 The Don’s Special is very similar to another Stevens pattern, the Blue Dragon. Here, I must interject: The Blue Dragon, in the photo of an original tied by Carrie Stevens in the Graydon and Leslie Hilyard book, Carrie Stevens: Maker of Rangeley Favorite Trout and Salmon Flies, 2000, is quite clearly shown wearing the blue hackles on the outside of the wing, though the written recipe in Hilyard’s book has the blue hackle inside the outer wing of grizzly. I have studied the photo of Carrie’s Blue Dragon fly with a magnifier, and also asked several other fly tiers their opinion on the wing of the Blue Dragon. We all concur that the hackle order of the wing on the Blue Dragon, inside out, is: gray, grizzly, blue. This also makes so much more sense for the pattern name, Blue Dragon, as opposed to the placement of grizzly hackles on the outside of the wing. Finally there is a very noticeable difference in the appearance of the Don’s Special when compared to the Blue Dragon. Both patterns in the Hilyard book are Stevens originals; the Blue Dragon is obviously quite blue in its overall color scheme, while the wing of the Don’s Special is predominantly grizzly. The other two patterns Carrie named after Don Bartlett are the Don’s Delight and the G. Donald Bartlett. I recently posted the G. Donald Bartlett, and I will follow up here on my blog before too long with the Don’s Delight. 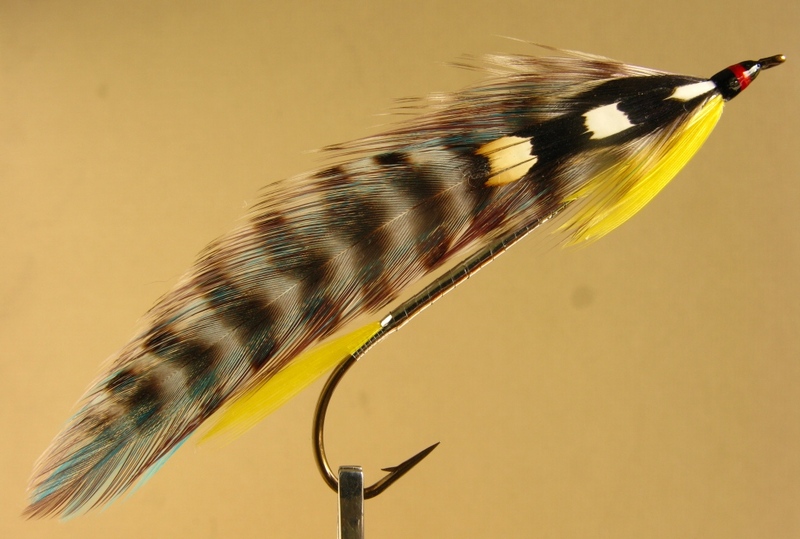 All the Carrie Stevens patterns I post here are placed in my Carrie Stevens Pattern Dictionary category, under the heading category of Streamers and Bucktails. Don’t forget to use the Search Tab when you may want to locate something here on my blog. Don’s Special – tied and photographed by Don Bastian. 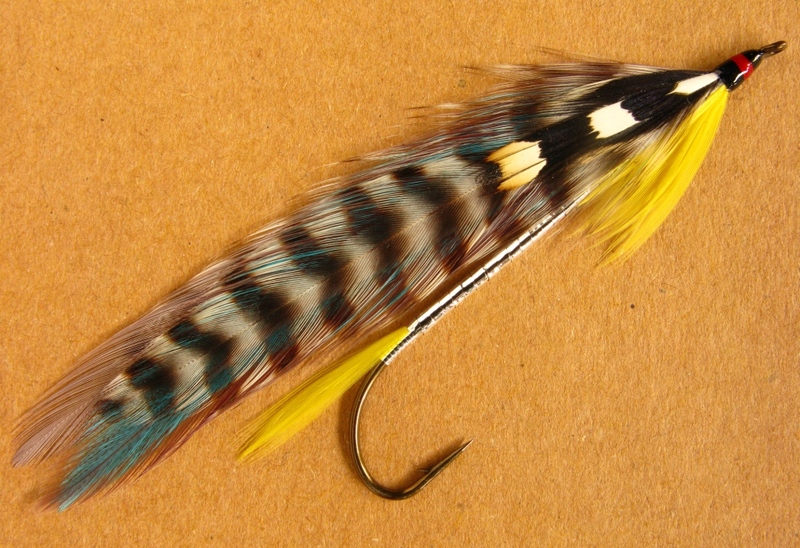 The hook is a Gaelic Supreme Martinek / Stevens Rangeley style streamer, No. 2 – 8x long. Don’s Special – card-mounted. Tied and photographed by Don Bastian. (Note: that’s not my current phone number). It is: 570-998-9124. Thread: Depending on hook size, heavier thread such as Danville 3/0 Monocord or Uni-Thread 3/0 may be used for the underbody beneath the tinsel. The advantage of using heavier thread on the hook shank is a quicker build of the thread underbody because fewer thread wraps means faster tying. Since this pattern has a tinsel body, black thread could be used. The Uni is much heavier than the Danville 3/0 due to inconsistencies of the aught thread rating system among thread manufacturers. For accurate thread ratings refer to the Denier system. Don’s Special – tied and photographed by Don Bastian.